It’s the rainy season in Ho Chi Minh City! 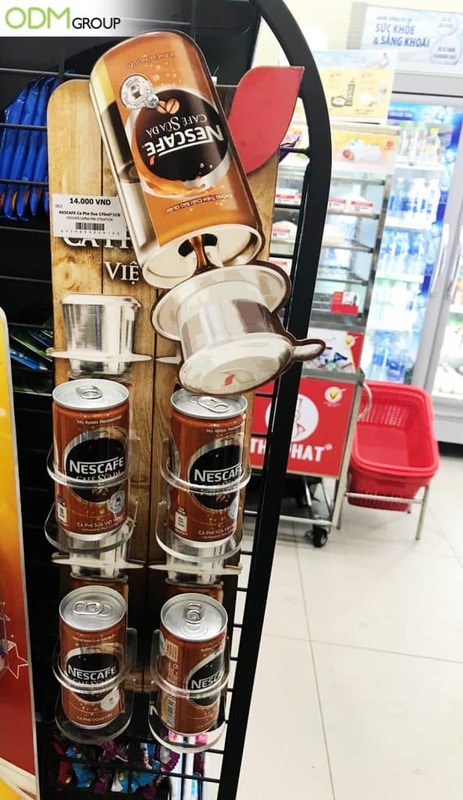 However, Nescafe Vietnam is keeping everybody warm with their custom display rack in their local convenience store. The use of a customizable display can help differentiate your brand from your competitors. Easy to grab and go, this retail display rack will certainly serve its purpose of bringing in more sales for Nescafe. The custom design by Nescafe is surely an eye-catching one! A 3D custom sign pop-up of Nescafe coffee has the ability to stand out among other brands. Furthermore, the sign is made up of not just one material, but three! cardboard, acrylic and plastic. Nescafe has certainly optimized all types of materials to create the most suitable and special POS display! How Would Retail Display Rack Help Increase Sales for Brands? Eye-Catching – With so many brands out there, it is most practical to come up with display that can engage with customers. As it is human nature to be drawn to attractiveness, having a visually aesthetic display is very important as it can make or break customer’s impression of a brand. A good example would be this POS display. So by establishing a good opinion, it can positively benefit sales and build brand awareness. Cost-Effective – The design of the customizable display is simple and easy to manufacture. The marketing strategy will certainly cut expenses without losing potential customers. Instead, it is an easier way of gaining traction in the market amongst a sea of competitors. Hence, for a start, brands will be more efficient if they adopt custom displays to boost brand visibility and recognition. Customizable – Custom POS displays can bring about many advantages. Having the design the way you want can set you apart from rivals. You can choose the colors that resonate with your brand which will improve brand retention. Furthermore, you can choose the type of material such as acrylic, metal and cardboard to make it which is within your marketing budget. This ensures that you would not spend more than you can gain. At ODM, we have a good amount of experience in manufacturing promotional products, custom display stands and brand packaging design that will definitely meet your needs! Feel free to send us an inquiry for more assistance! Read more about Mentos Creative Marketing! Likewise A Useful and Effective Display Stand by Mentos!